Details are emerging of the 58 people a gunman killed when he opened fire on innocent concert-goers in Las Vegas on Sunday night. They included a war veteran, a nurse and teachers. Chris Roybal, 28, was a US Navy veteran from southern California who had recently returned from Afghanistan. In his last public Facebook post, back in July, he described what is was like to be shot at, and spoke of the feelings of anger engendered by conflict. His friend and fellow navy colleague Matthew Austin wrote on Facebook: "It breaks my heart and infuriates me that a veteran can come home from war unharmed and events like these occur." Another military veteran also lost his life. Charleston Hartfield was a police officer in Las Vegas, off duty when he went to the concert. He also coached youth football, and was described as "the epitome of a citizen-soldier" by Brig Gen William Burks of the Nevada National Guard. The Tennessean reported the death of Sonny Melton, 29. The paper quoted his wife, Heather, as saying the nurse, from Big Sandy, saved her life by grabbing her as the shooting started. She says he was shot in the back. It took days of waiting next to the phone before the family and friends of Steve Berger found out he was dead, the Star Tribune reports. The financial adviser, whose three children are all aged under 16, had gone to Las Vegas to celebrate his 44th birthday. Friends who were next to him when he was shot managed to escape, but hoped he was alive. Denise Burditus, from West Virginia, was at the festival with her husband Tony. He later wrote on Facebook that she had died in his arms. She was a mother of two and "soon to be a grandmother of five", he wrote. A special education teacher from Manhattan Beach in California, Sandy Casey, died after being shot in the back. She was with her fiance, Christopher Willemse, at the concert. Manhattan Beach Middle School, where they were colleagues, described her as "absolutely loved by students and colleagues alike". Also from Manhattan Beach was Rachael Parker, a records technician with the local police department, who was with three other off-duty colleagues at the concert. She was among two who were shot, ultimately losing her life in hospital. Her colleague suffered minor injuries, the Manhattan Beach Police Department said, adding that Ms Parker had been with them for 10 years and would be greatly missed. Jennifer T Irvine, 42, was a family law attorney with her own practice in San Diego. Her website said that outside work, she was a black-belt in Taekwondo, an avid snowboarder and was aspiring to learn to rock climb and skydive. Michelle Vo, 32, from San Jose, California was remembered by friends as a "very bubbly and happy" person who donated blood every two weeks and was never short of energy. The financial adviser had recently ended a relationship and was attending the Las Vegas concert by herself. Kody Robertson, an Ohio man whom she had befriended earlier that night and danced with at the concert, said he had tried in vain to save her by jumping on top of her as the gunfire began. Thomas Day, a house builder in California, was at the concert with his four children, who survived. "He was the best dad. That's why the kids were with him," his father told the LA Times. Mr Day's friend Austin Davis, a pipe fitter from Riverside in California, was later confirmed to have died too. He played softball and liked to sing karaoke to country music. Stacee Etcheber, a hair stylist and mother of two, was at the concert with her husband, a San Francisco police officer. San Francisco police called her "well-loved" in a statement, continuing: "Stacee was taken in a senseless act of violence as her husband, SFPD Officer Vinnie Etcheber, heroically rushed to aid shooting victims in Las Vegas on Sunday." Redondo Beach, California native Christiana Duarte, 22, had recently graduated from Arizona University and was beginning her first full time job for the Los Angeles Kings hockey team. "Chrissy was a bright beautiful young woman, full of life and energy," friends said on a fundraising page set up to help her family with funeral expenses. Erika Eastley, who had been friends with "Chrissy" since the age of four, told the BBC she "was a big sports fan and adventurer". "She just had so much going for her." Thirty-five-year-old skydiver and mother-of-three Hannah Ahlers was "a devoted mother and wife", a friend said, and "one of the most beautiful women I have ever seen, with a heart to match". Cameron Robinson, 28, had taken Monday off work to attend the festival with his boyfriend, Bobby Eardley. Mr Eardley, who was injured in the attack, described holding Robinson in his arms as he died. He was an "amazing, determined, hardworking man that spent his life always striving to be better", Mr Eardley told US media. He added that "he was quiet and shy, but once you got to know him he was goofy and fun and so enjoyable". According to the fundraising page set up in his memory, Robinson enjoying cooking, entertaining, running marathons, travelling, camping, boating and being outdoors. On Facebook, his sister wrote: "I was never suppose to say goodbye to you, little brother. You were suppose to take over the world... I love you to the moon and back." Heather Warino Alvarado, will be remembered as a "devoted wife and mother, willing to do anything for those in her life", said her friend Megan Gadd. The mother of three from Cedar City, Utah, was married to a local firefighter, and the fire station has set up a fundraising account in her name. "She was happiest when she was together with her family, especially her children and she would do ANYTHING for them," her husband Albert said in a statement. Jack Beaton, 54, had road-tripped with his wife from California to attend the concert for their 23rd wedding anniversary. As gunfire rang out, Jack threw himself and his wife Laura to the ground and laid on top of her to shield her from the bullets. "He told me 'I love you, Laurie' and his arms were around me, and his body just went heavy on me," she recounted to the Associated Press. Candice Bowers, 40, raised two girls before recently adopting her two-year-old niece. The never-married restaurant waitress rarely took time for herself so friends, and family were thrilled when she decided to go to Las Vegas for a weekend of country music. "She was a generous girl," her grandmother told OCregister.com, adding that "she never had any support, except herself". Californian Andrea Castilla was celebrating her 28th birthday at the festival when she was shot in the head. Her friends and boyfriend tried to shield her as the gunfire continued, a GoFundMe page set up for her family says. She worked in a cosmetics shop and her brother told People magazine that she had been inspired by their mother's cancer treatment to help others look and feel beautiful. Angie Gomez, a cheerleader from Riverside, California, was "a cheerful young lady with a warm heart and loving spirit" according to a fundraising page set up for her family. Melissa Ramirez, 26, had recently graduated from California State University Bakersfield (CSUB), and had been working for AAA Automobile Club of Southern California, according to her Facebook page. "We are terribly saddened to learn that we lost a member of our CSUB family in this senseless act of violence," the university president said in a statement, adding that flags on campus would be flown at half-mast for the week. Dana Gardner, 52, had been a San Bernardino county employee for 26 years and was described as a "go-to person" and a "dedicated public servant". Lisa Patterson, 46, had three children aged 19, 16, and eight, said her husband Bob, adding that she was a constant presence at the girls' softball games. "My daughter loved her mommy so much," he told People magazine. "I don't think it has completely sunk in yet that mommy's not coming home ever." John Phippen, from Santa Clarita in California, was reportedly shot in the back. The Signal reports that Mr Phippen's son, Travis, was shot in the arm but survived. Also from near Santa Clarita was kindergarten teacher Jenny Parks, who was at the concert with her husband Bobby. "She was truly one of the most loving people you could ever hope to meet," Mr Parks' uncle said. A fundraising page has been set up to help Mr Parks, who was injured in the attack, and their two children. Vista Elementary School in Simi Valley, a few miles west of Santa Clarita, confirmed it had lost its office manager, 53-year-old Susan Smith. Principal Julie Ellis told Simi Valley Acorn news website in an email she "was a wonderful person - kind, loving, patient with our students, efficient, and she had a wonderful sense of humour". Jordyn Rivera, 21, of La Verne, California travelled to Las Vegas with her mother for the concert. Rivera was a fourth-year student in the healthcare management programme at California State University, San Bernardino, the university said confirming her death. She had recently spent time in London on a study-abroad programme, school administrators said. Couple Denise Cohen and Derrick Bo Taylor had attended the concert together after travelling from California. Taylor, a prison corrections officer, had led inmates around the state helping to extinguish wildfires. Cohen, a property manager in Santa Barbara, California, was very active in her church and had planned to volunteer an avocado festival this coming weekend, her friends say. Leana Orsua, Cohen's roommate, wrote online: "Denise, we love you so much, I know you are in heaven right now dancing to a country song, and dancing and smiling at all of us." A fundraising page has been set up for the family of Rhonda LeRocque, from Tewksbury, Massachusetts. Her aunt, who set up the page, said she was a much-loved wife and mother of a six-year-old girl. Youth baseball and wrestling volunteer coach Bill Wolfe Jr, 42, had travelled from Pennsylvania with his wife for their 20th wedding anniversary. "His leadership, enthusiasm, and care and concern for these children will be greatly missed and certainly never forgotten in this community," said the Shippensburg Little League association, where he volunteer coached for six years. California IT firm Technologent confirmed that one of its employees, Neysa Tonks, had died in the shooting. They described her as a great mother, colleague and friend who "brought so much joy, fun and laughter... she will be greatly missed by all!" They too have set up a fundraising page. Disney boss Robert Iger paid tribute to Carrie Barnette, who had been part of the Disney California Adventure culinary team for 10 years and "was beloved by her friends and colleagues". He also prayed for the recovery of another Disney staff member, Jessica Milam, who was seriously injured in the attack. Kelsey Meadows, 27, worked as a substitute teacher and was honoured by one of her students who wrote "thank you for all the great time you gave me as well as many other students". Her alma mater, Fresno State University, said they would fly the flag on campus at half-mast for her. A vigil was held for 20-year-old country music fan Bailey Schweitzer at her place of work, Infinity Communications in Bakersfield, California, on Monday evening. "She was everything to us," her colleague Amie Campbell was quoted as saying. The Alaska Dispatch News reports that two Alaskans were killed in the shooting - Adrian Murfitt, 35, a salmon fisher who was at the country music festival with friends, and Dorene Anderson, 49, a stay-at-home mother who was there with her daughters. Both came from Anchorage. 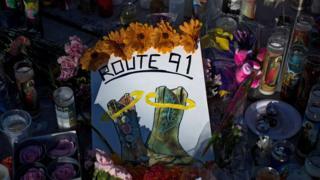 Kurt Von Tillow, 55, of Cameron Park, California, went with several members of his family to the concert. His sister and niece were wounded but are expected to recover, while his wife, daughter and son-in-law escaped uninjured, Sacramento TV station KCRA reported. His brother-in-law described him as a true patriot who loved a beer, "smiling with his family and listening to some music". At least four Canadians are among the dead. Calla Medig had made visiting Las Vegas an annual adventure, but Sunday's concert would be her last. The 28-year-old waitress from Jasper, Alberta was remembered by colleagues as a "beautiful soul" whose smile lit up the room. The Jasper Royal Canadian Legion branch lowered its flag in Medig's memory. Jordan McIldoon was not alone when he died in the Las Vegas shooting. When the 23-year-old from Maple Ridge, British Columbia, was separated from his fiancee Amber Bereza, bartender Heather Gooze took his hand and held it while he died. His parents describe him as "fearless" and said he enjoyed outdoor sports like BMX biking and snowboarding. "He was our only child and no words can describe our pain in losing him," his mother Angela McIldoon wrote in a statement. Single mother of four Jessica Klymchuk was in Vegas with her fiance Brent Irla when the shooting started. The 34-year-old from Valleyiew, Alberta "wore many hats" as a bus driver and an educational assistant and librarian at a local Catholic primary school. "She did so much for her children, she went over and above for them," her former colleague Tina Moore told the Edmonton Journal. Tara Roe, 34, was the third Albertan to be identified as a victim of Sunday's attack. A mother of two and model, she was shot after she was separated from her husband and friends at the concert. The Okotoks, Alberta, resident is remembered for being a "caring spirit".